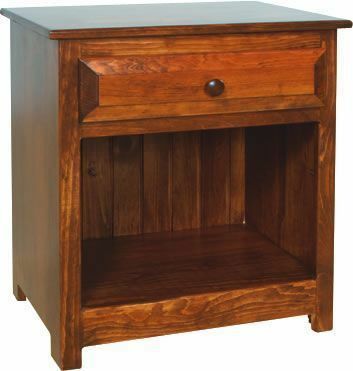 Lookin' fine in solid pine, the Amish Pine One Drawer Night Stand is rich with solid wood. Pine is softer, but strong and you can rely on it to serve for may years. It's also a very affordable solid wood. This pine nightstand has one strong pine drawer box and an open base for storage. Night stands bring balance to the bedroom while offering handy storage options. Where is My Amish Furniture Coming From? At DutchCrafters, we offer the largest collection of Amish furniture online and we work with over 150 Amish vendors throughout Indiana, Pennsylvania and Ohio. This Pine One Drawer Nightstand is part of the Heritage Pine Collection that's crafted in Pennsylvania. Woodworkers a this shop craft heirloom hutches, cabinets, bookcases, pie safes and other cased goods. If you have a custom request, be sure to email or call it in to us! The Heritage Pine Collection ships for free anywhere within the continental United States--another perk of ordering this solid pine furniture! Build time for this beautiful pine nightstand is 6 to 8 weeks. Please allow additional time for shipping. Thank you for shopping with us!